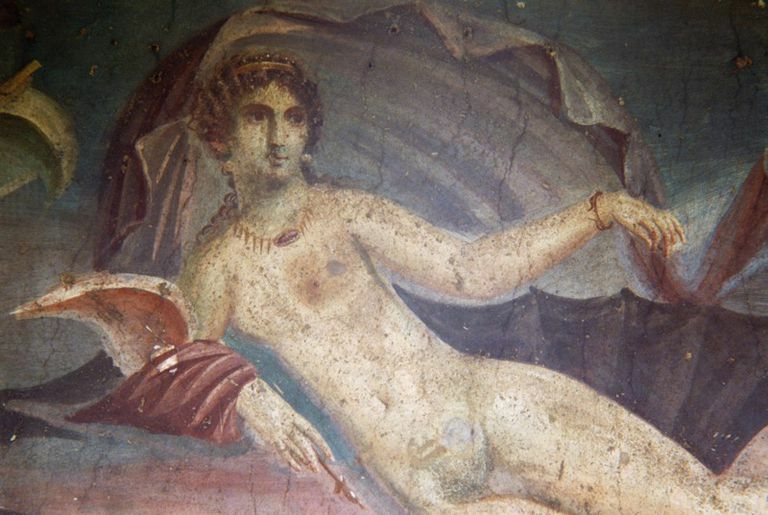 Venus in shell, detail from fresco in peristylium, House of Venus in the Shell, Pompeii (UNESCO World Heritage List, 1997), Campania, Italy, Roman civilization, 1st century AD. Venus is about seduction and desire. Her realm is yin, the feminine, the night and the mystery of attraction - and repulsion! Venus is a bigger deal for women, writes Stephen Arroyo, in terms of feminine identity and sexual intimacy. In his Chart Interpretation Handbook, he writes, "A woman needs to experience the qualities of her Venus sign in order to feel feminine." But ladies take note - for a man, Venus shows what's especially lovely. Writes Arroyo, "It describes the type of woman that erotically attracts a man, that looks good to him aesthetically and turns on his feelings." But, he points out, a man's Mars sign is a tip off to what stokes his sexual fire. What's your Venus sign? Look for Venus' symbol on your birth chart. You know the one - it's the symbol for women in general, and lis shaped like Aphrodite's mirror for self-reflection. Read about your Venus sign. Venus makes the world go 'round. Really and truly, it's what we reach for in the end - what and who we love. And Venus in your natal chart is how that love force is expressed. It's your feeling nature, and what you desire. And it shape your tastes in art, home decor and wardrobe. Venus' spot in the chart shows where this force is at its most charged. Take note, since it's also a point of attraction - attracting wealth, a beloved, even the job of your dreams. Venus is a two-way street, being the planet of give and take. It's what attracts and what you're attracted to also. It's what you desire and what you hate, too. Venus has to do with magnetism, and how it affects that mystery current called flow. It's to do with generosity of spirit, which opens up the love and friendship flow. And it's associated with self-expression, which then opens up the admiration flow. It's to do with cultivating your gifts, and that then affects your cash flow. If your Venus is sitting pretty in the chart, you can be lucky in love, and attract bounty. If your Venus has challenging aspects (squares and oppositions), your path may be a bit bumpier. Venus shows the kinds of friends you attract naturally. Clashing Venus signs can lead to misunderstandings because of different expectations about what it even means to be friends. Venus is a clue to how you experience good feelings, and in what situations these are teased out. If your Venus is in harmony with a friend or lover, you create an atmosphere of good moods. This in turn, brings out your lovely side. And then you create good times together. Quite simply, Venus acts as a muse, leading you toward your passions. Through her eyes, you see the poignancy and color in life, and in return, may offer a personal expression of it, through an art form. But beyond that, it is how you pass on and integrate what you’ve absorbed of the meaning of life through your all-important and ever evolving web of relationships. In mythology, Venus is the Roman name for the Goddess of love and beauty - her Greek name is Aphrodite. Your Venus describes how you love, whom you love, and what you love. Venus Love Compatibility is a biggie, when you're musing on a love match between two charts. Venus is the "sister star" to the Earth, and shines brightly and visibly due to her close proximity to the Sun. At times, Venus is the "Morning Star" and rises before the Sun, but at other times she is the "Evening Star." There are periods in between and after where she disappears in retrograde, and early myths described this as a journey to the Underworld, followed by her triumphant re-emergence. Venus Words: romance, relating, friendships, art & beauty, harmony, attraction, passions, venerate, adore, abundance, overindulgence, narcissism, luxury, prosperity, allure, rapport, friend or frenemy. Venus into Virgo - Here's the Love Scope!